While others use techiques like welding, waxing, glueing or knotting, which often damage your hair, Great Lengths uses a much more gentle principle: modulating - an extremely high tech method of attachment between the Great Lengths strand and your own hair. The Great Lengths applicator activates the bond (composed of polymer chains whose molecular structure is very similar to that of human hair) and joins the Great Lengths strand with your own hair. 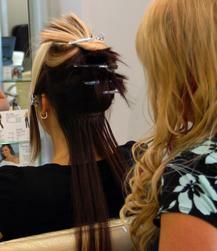 When you are ready to have your extensions removed a special solution is applied that disintegrates the bond. 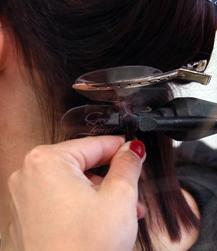 With Great Lengths you can achieve the impossible and there are no limits with what you can do to your hair. Swimming, dancing, playing tennis or skiing...If you regularly take care of your hair and your extensions your lifestyle will be trouble free. The "cold fusion" method uses no heat. The Great Lengths strands are attached via ultrasonic wave. Check out our portfolio of work to see what you can achieve with Great Lengths hair extensions.